Opening reception at 6.30 - 10 pm. 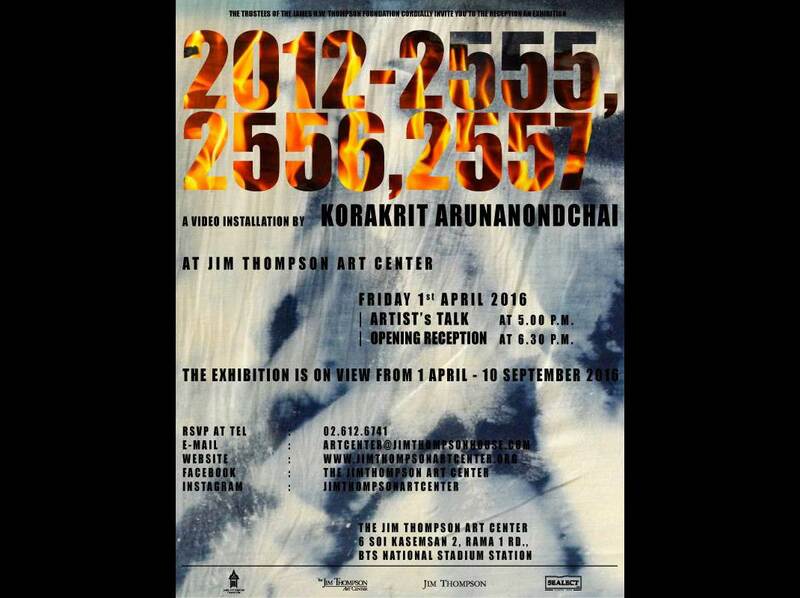 The Jim Thompson Art Center is pleased to present a video installation 2012-2555,2556,2557 by New York-based Korakrit Arunanondchai, an acclaimed young artist of international renown. This is his first solo show in Thailand and follows his most comprehensive solo exhibitions to date at MoMA PS1 in New York in 2014, Palais de Tokyo, a modern and contemporary museum in Paris and UCCA Ullens Center for Contemporary Art, Beijing, PRC in 2015. Korakrit’s works, which encompass paintings, performances, installations and videos, are grounded in his experiences of the relationship between the East and the West, exploring what art is as well as the relation between art and life. His practice is not a simply a question of advanced technology – such as the Internet and social media - but one of modern society including pop culture and religious symbols in Buddhism, Christianity and Animism. His artworks bridge such concepts as lifestyle in the opposing cultures of Eastern and Western beliefs, fiction and reality and the world of science and technology including the environment and our future. The exhibition 2012-2555, 2556, 2557 is organized by the Jim Thompson Art Center and runs from 1 April to 10 September 2016. The gallery is open from 9.00 to 20.00 (free admission).